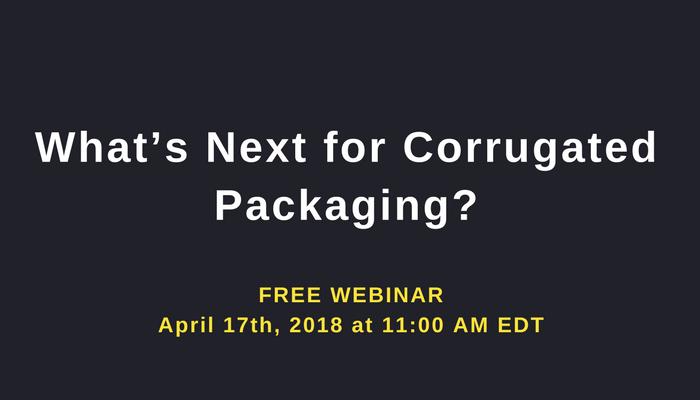 Bloomberg Intelligence, Numera Analytics and Vertical Research Partners analysts invite you to join us for a joint webinar regarding key issues facing corrugated packaging markets, with a focus on North America and Europe. Numera’s David Vallières along with VRP’s Chip Dillon and Bloomberg’s Joshua Zaret will discuss the supply/demand and pricing outlook in North America, new/projected capacity additions, secular demand sources, as well as China’s wastepaper import restrictions and what they mean for US containerboard producers. To participate in this webinar taking place on Thursday, April 4th, 2019, 10:00 AM EDT, please register here. Neglecting the assessment of risk by solely offering point forecasts is leaving you vulnerable to unforeseen surprises or worse, to extreme events like what transpired in 2008. 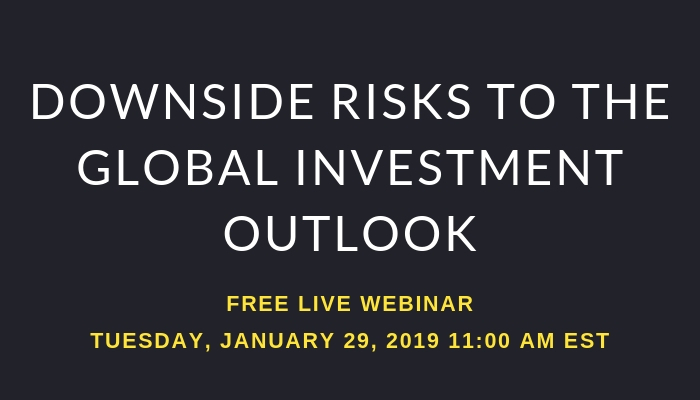 Join Numera’s Head of Macro Research & Senior Economist, Joaquín Kritz Lara and Chris Cook, Vice President of Global Macro Solutions for a live webinar covering key issues shaping the global investment outlook in 2019. 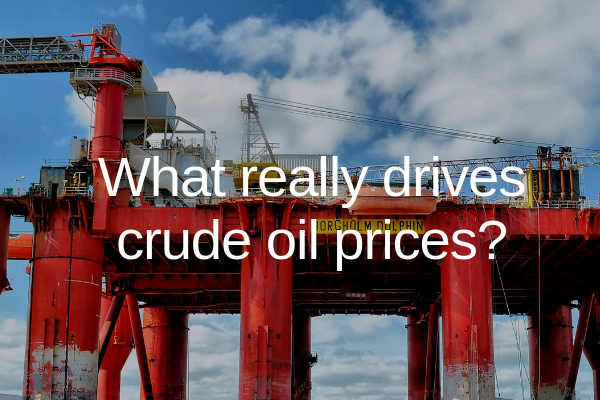 What really drives crude oil prices? Like any global commodity, oil price changes are a consequence of shifting supply and demand conditions. Sudden movements – like November’s steep declines – receive ample media coverage, with industry observers providing controversial explanations for their underlying cause (consider President Trump’s recent tweet on oil prices, OPEC and the role of supply). Webinar – Where do pulp markets go from here? Bloomberg Intelligence, Numera Analytics and Vertical Research Partners analysts invite you to join us for a joint webinar on key issues regarding the global pulp market, which has seen an extraordinary run-up in prices the last two years due to accelerated global economic growth and significant unscheduled mill downtime, along with an environmental clampdown in China on polluting capacity and recovered paper imports. To participate in this webinar taking place on Tuesday, November 13, 2018, 11:00 AM EST, please register here. Bloomberg Intelligence, Numera Analytics and Vertical Research Partners analysts invite you to join us for a joint webinar regarding key issues in the volatile recovered-fiber market and its impact on market pulp and corrugated packaging. 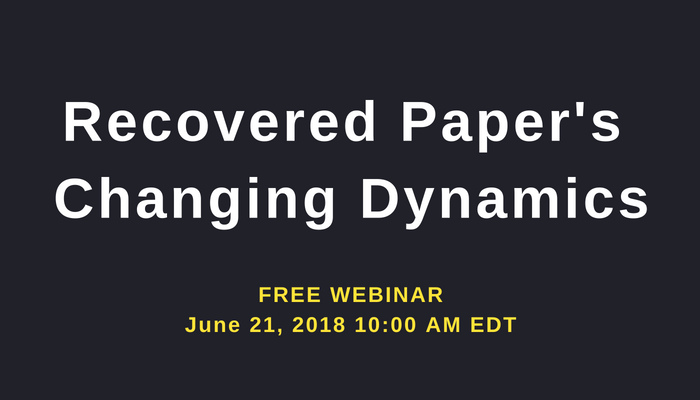 To participate in this webinar taking place on June 20, 2018, 10:00 AM EDT, please register here. 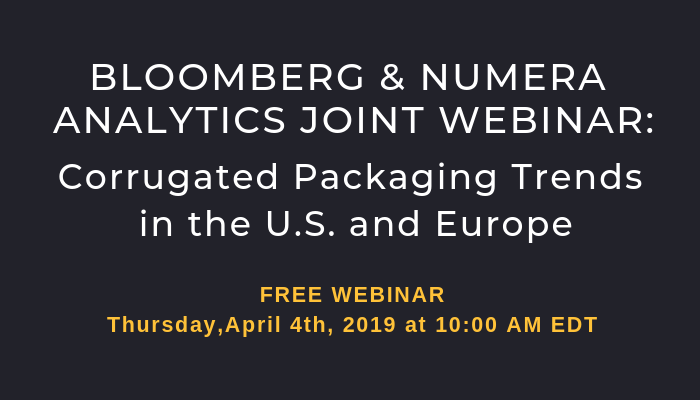 Bloomberg Intelligence, Numera Analytics and Vertical Research Partners analysts invite you to join us for a joint webinar regarding key issues facing the corrugated packaging market, with a focus on North America and Europe. Paul Leclair, Vice President and Chief Economist at Numera Analytics, will discuss demand for corrugated boxes, which has been growing at a healthy clip in North America and Europe. He will focus on how long it can last by zeroing in on the market segments that are driving the growth and macro headwinds that could derail the expansion. To participate in this webinar taking place on April 17, 201,8 11:00 AM EDT, please register here. Global retail spending slowed down somewhat in December, falling 0.1% from its November level. As a result, retail volumes closed the year up 4.6% from 2016, exceeding the rate of growth implied by fundamentals (+4.4%). Transitory income shocks have now pushed private consumption 0.5% above its stable growth path, adding to inflationary pressures. Global CPI inflation accelerated in the fourth quarter, rising 3.8% SAAR. Considering PPI inflation is currently well above its steady-state level (4.1% versus 1.7%), we expect consumer prices – and in particular retail prices – to accelerate in 2018, increasing the likelihood of monetary tightening. To view the complete analysis, contact us and enroll in a free 3-month trial of Numera’s Global Retail Sales Report. Global manufacturing surged last December, rising 7.4% SAAR (+4.9%y-o-y) to close the year up 4.0%. The gap between actual and potential output widened by some 20 basis points to 1.5%, the largest cyclical deviation since mid-2008. As expected, PPI inflation weakened somewhat in December (+0.3%) held back by sluggish growth in raw material prices. Global producer prices rose 4.1% in 2017, fully recovering the losses from the two previous years. Given the delayed pass-through from producer to consumer prices, tight operating conditions should drive up CPI inflation in 2018 even if the cyclical momentum dissipates. Want to read more? Contact us to receive a free 3-month trial and view the full Global Manufacturing report. Global industrial production accelerated further in December, this time rising at an annualized rate of 7.7% (+4.1%year-over-year). Production was up 3.5% for the year as a whole, a significant improvement from the 1.8% increase recorded in 2016. Underlying the headline figure was a 4.0% increase in manufacturing activity, facilitated by a noticeable pick-up in private sector investment. In OECD countries, demand for fixed capital (structures, equipment) grew 3.5% last year, compared to 1.6% in2016. Unsurprisingly, output growth stemmed primarily from durable goods industries. Want to read more? Contact us to receive a free 3-month trial and view the full Industrial Production report. Global retail spending rose markedly in November, exceeding 5% growth for the first time in the post-crisis period. Strong growth was both a reflection of permanent and transitory factors. About two-thirds of the overall increase reflected strong equilibrium consumption (+4.7% year-on-year). Positive demand shocks accounted for the remaining third, with the consumption gap rising three basis points to 0.6%. Rapid growth in demand, alongside rising inflation expectations, supported global CPI inflation, up 5.1% SAAR in November.